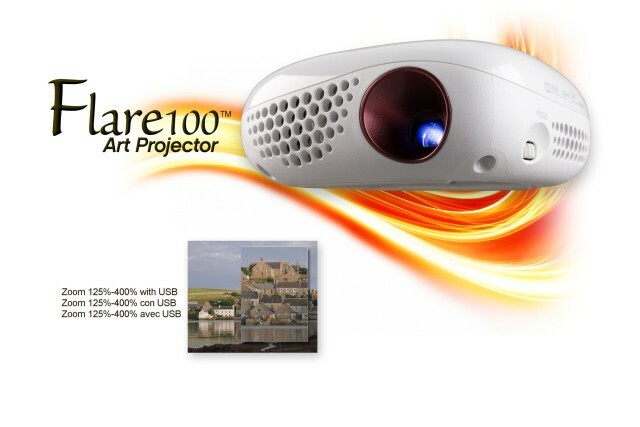 A great line of Art Projectors gets even better! 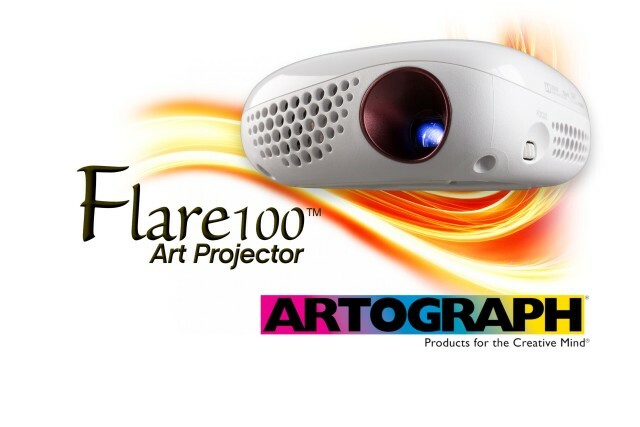 See the NEW Flare150 digital Art Projector by Artograph. The FLARE100™ Art Projector sets the artist free, with a battery-operated projector in a size to go anywhere. 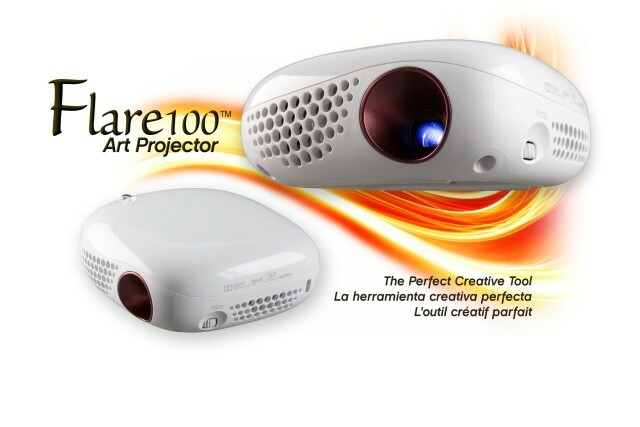 The Flare100 projects a sharp image from as close as four inches from your surface all the way to mural size. Artists need never be without their art portfolio or client demos with the Flare100 and a flashdrive, or using the wireless screensharing feature with Android devices. 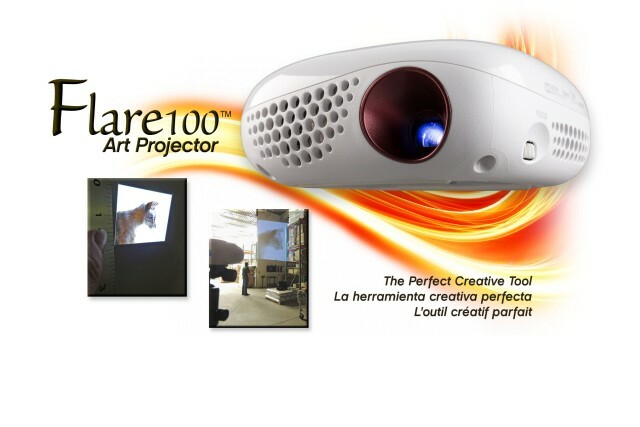 The Flare100 projects a clear, useable image from as close as four inches, to as far as 100 inches. The image on the left shows the Flare100 projecting an image only a few inches high. The image on the right shows the Flare100 projecting the same image about 9 feet tall. We projected this image in our warehouse (notice our engineer standing below the projection), only dimming the lights, not shutting them off entirely. This is the instruction guide included on the CD ROM with your projector. Whether it's image clarity, copy reduction/enlargement, or color-corrected brightness you need, select the optimal model to create banners, murals, paintings, or the precision clarity necessary for airbrushing and fine art. 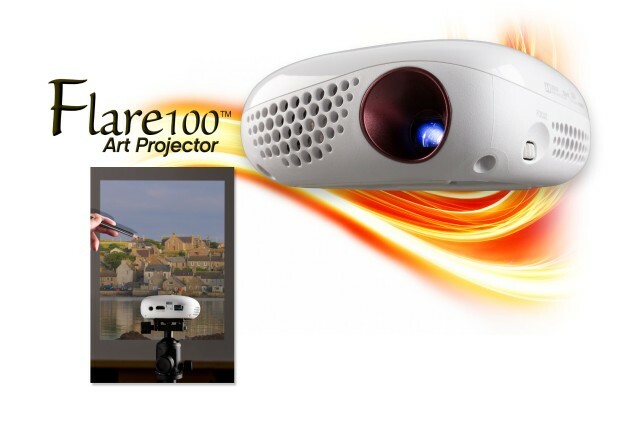 The FLARE100™ Art Projector sets the artist free with a battery-operated projector in a size to go anywhere. 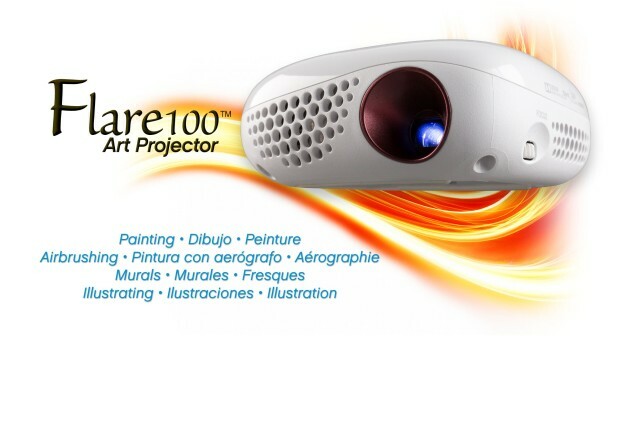 The Flare100 projects a sharp image from as close as four inches from your surface all the way to mural size. 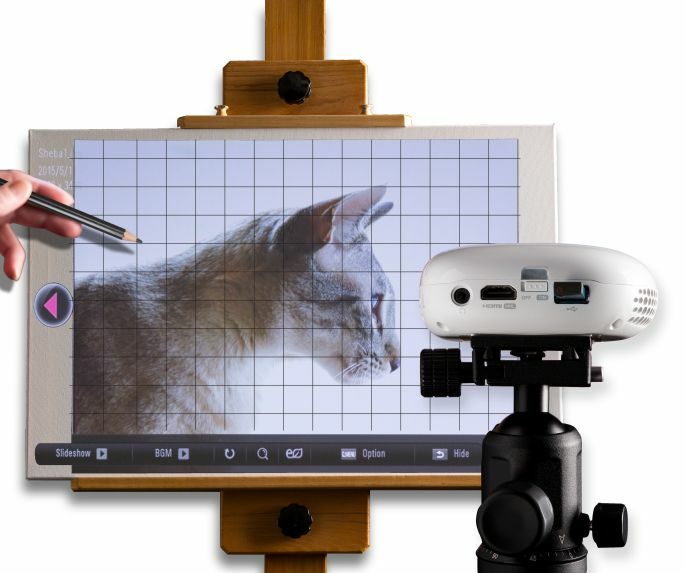 Artists need never be without their art portfolio or client demos with the Flare100 and a flashdrive, or using the wireless screensharing feature with Windows or Android devices. 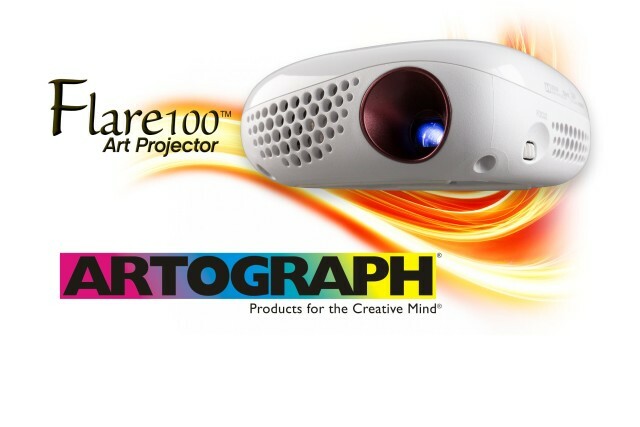 The INSPIRE800™ Art Projector continues upgrading the Artograph projector line stepping up from the popular LED500 with 800 lumens of brightness and enhanced contrast range. The addition of wireless screensharing for Windows and Android devices makes the Inspire800 more versatile than ever. 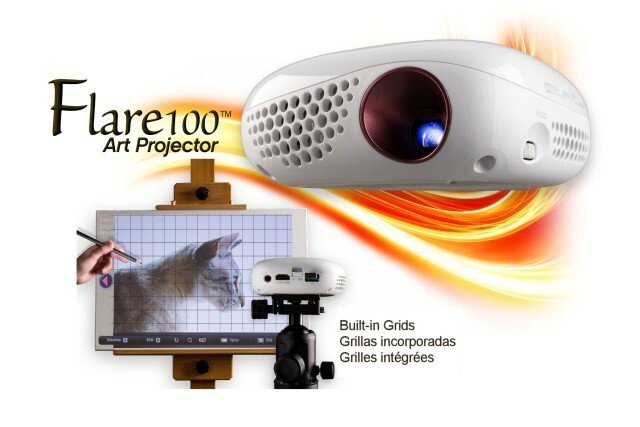 Each of these new projectors includes Artograph’s built-in grids for design and composition. The Flare100, Inspire800, and Impression1400 include 22 custom grids with a bonus set of border patterns and geometric shapes. Use the grids and patterns alone, or superimpose them over your image for precision layout.